1948 Bowman Football ushered in the modern football era. While no company has been around long enough to stake a claim as having issued cards for all those years, there hasn't been a year since 1948 where a set of professional football cards hasn't been released. 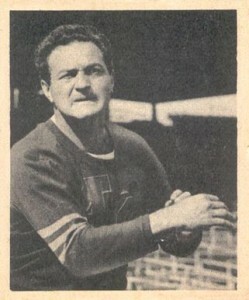 The 1948 Bowman Football card set consists of 108 total cards measuring 2-1/16 by 2-1/2 inches. 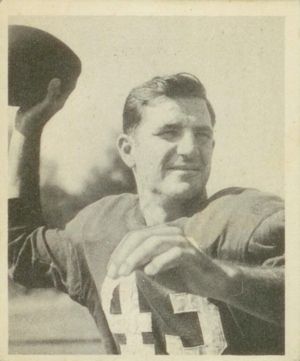 The set boasts key rookie cards of ten future Hall of Fame players including Steve Van Buren (#7), Sammy Baugh (#22), Bulldog Turner (#36) Pete Pihos (#63) and Sid Luckman (#107. 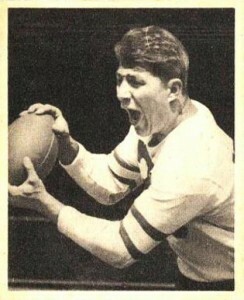 Bowman was also able to include several rookie cards of players that didn't appear in the competing 1948 Leaf Football set. The design of the 1948 Bowman Football card set is very similar to that of the 1948 Bowman Baseball set. 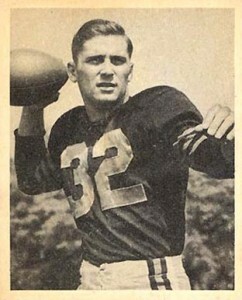 The card fronts have a simple black-and-white player photo surrounded by a white border. Pictures run the gamut from posed pictures to portraits. Some players are wearing their leather helmets, others are bare-headed. No other design elements are included like logos, names, teams, etc. The back of the cards resemble the format of 1949 Bowman Baseball by using two different ink colors. The card number is listed along the top in red, followed by the player's name and sometimes his nickname in black. The player's position and team follow, along with three lines of vital statistics. A short biography highlights the player's career. At the bottom of the card is one of several wrapper redemption offers. The offer itself is printed in red ink, with an image of the item in black. A copyright line and expiration date run along the bottom edge of the card as well.. 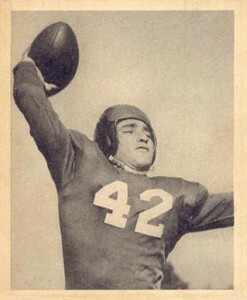 The 1948 Bowman Football was printed on three 36-card printing sheets. The cards were printed by every third number, where series one had cards #1,4,7,10 and so on. Series two featured cards #2,5,8,11 and series three has all the cards divisible by three. The cards from the third series are the scarcest, with the second series being slightly harder to complete than the first. 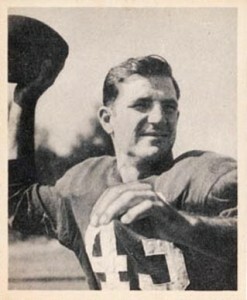 Unlike 1948 Leaf Football, Bowman did not issue cards of collegiate players. 1948 Bowman Football cards are known for having centering issues, which makes top-condition cards tough to locate. In addition, the white borders of the cards leave them prone to yellowing from age and susceptible to staining. The popularity of the set has grown in recent years as a result of having been overlooked for so long. Vintage collectors appreciate the simplicity of the design, lack of costly variations and the strong rookie class. Much more affordable then other early set, the 1948 Bowman Football card offering is one that deserves a second look. 1948 BOWMAN #68 BILL MOORE PITTSBURGH STEELERS ROOKIE CARD CENTERED! 1948 Bowman 66 Cecil Souders SP. PSA 6 EXMT w clean reverse. (TX7424RXM). 1948 Bowman #10 Chris Iversen PSA 8 New York Giants . 1948 Bowman #95 George McAfee RC PSA 8 Chicago Bears HOF ..